This is a great quality plug and play mic that connects directly to your computer or laptop through a USB port. The ease of use makes it an ideal choice for home studio and field recording. 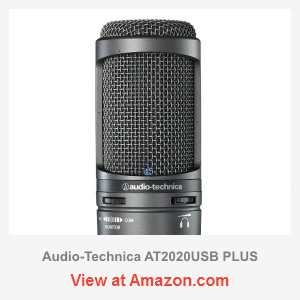 Audio-Technica AT2020USB goes even further by bringing you the unseen before superior sound, which makes it comparable to more expensive studio units. Not only does it perfectly suit tasks like podcasting or voiceovers, it achieves quite a professional performance with vocals and even instruments. Whatever is that you are recording, you will never get disappointed with its sound quality! As for the price, it’s also very reasonable. AT2020USB produces crisp and clean sound… comparing to a number of models in the same price range, it comes out the winner. The mic has a steady frequency response that makes it more musical. This is actually the best curve you’ll ever see on a USB mic. 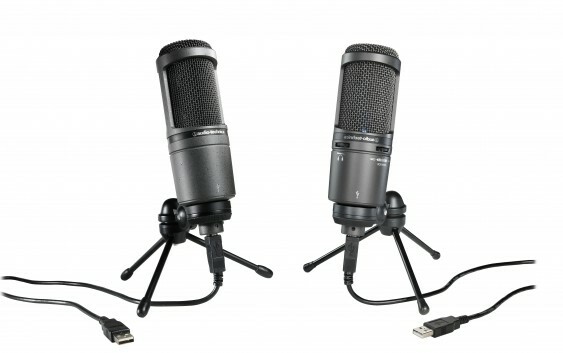 Other mics, such as Yeti USB tend to use cheaper capsules and end up sounding harsher especially in the higher range. Those imperfections tend to get even more audible due to the digital sampling. On a side note, the USB interface itself has a limited capacity, which tends to cause hindrance for the upper high portion of the spectrum. Thus XLR version of AT2020 with the same capsule may produce a crispier response. Yet again, this is hardly concerning for normal application. I will repeat that for vocal and instrument range it does a superior job. The body of AT2020USB is apparently made of rugged metal intended for durable performance, and indeed, it seems it can survive a good amount of abuse. It has nothing to break, the capsule is also protected by a rigid grid. It uses an old-school square USB connector often found on printers. In my opinion, it is better than mini-USB, which tends to detach and bend. 10 feet USB cable is included in the package, for which if needed you can easily find a replacement. The package also includes tripod. Unfortunately, the tripod is too low and wobbly, and the mic actually weighs it down… garbage but, this is the only con. You can replace it with your favorite shock mount of choice. 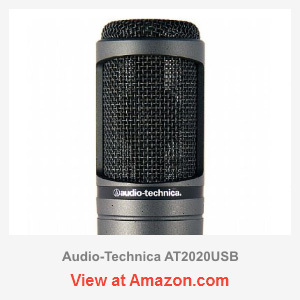 This is of course not a high-end microphone, though for most users it will hardly make any difference. It has more than enough quality needed, and that USB interface certainly makes its use more convenient. For instance, you may easily create some decent videos and immediately publish them to YouTube. No other equipment will be needed aside from this mic and a working webcam. Besides, when you publish your videos the sound gets down-sampled so even a thousand dollar mic will sound roughly the same. Now when it comes to podcasting, you’ll never need a high-end microphone either. On the other hand, if you want to achieve an even more professional, studio sound you may also consider getting an XLR microphone. It’s not because XLR mics produce a significantly better sound by definition (though this is also true), but you will get a lot more flexibility needed for professional recordings. For instance, USB cannot be connected to a mixer, so it’s preferable if it at least provides some monitoring options. On the other hand, with XLR you can get a better setting with your preamp and gain an option of using things like de-essers, etc. Decent room acoustics goes without saying though. There is also a more recent modification available on the market. The model is called AT2020USB PLUS. The main advantage is it has a headphone output, which allows monitoring with zero-latency. This is an invaluable feature for anyone using multi-track recording. It allows you hearing exactly how this or that record will sound in the mix, so its value cannot be overestimated. It thus resolves the problem the users complained about the original version. On the other hand, this feature results in added cost, so the original version is still in use. Do check the prices though, because sometimes you may find it on discount! AT2020USB PLUS has two added controls. The first allows controlling the headphone output volume. The other control brings an interesting feature of blending the microphone with pre-recorded audio. You can also make one or another sound more prominent and adjust the blending however you like. The monitor output does deliver a good quality too, especially when coupled with a nice piece of headphones. I would personally advise to add more and get the PLUS version, even if you do not fully realize its advantage yet.